You may need care yourself in the future or have a relative receiving care already. The worry is that the money could run out and that maybe you will have to switch to a cheaper level of care or become a burden on your family. Many people also worry that if care costs use up all of their savings and assets, there will be nothing left to pass on to their children or other family members. We specialise in providing advice and guidance in the complex area of care fees planning. We can help both individuals who need care, and their families, understand the implications of care requirements, state benefits and local authority support, explaining the solutions available to them to pay for the care. There are a variety of solutions available that can be tailored to fit individual circumstances and objectives, therefore it is important that professional advice is taken from an appropriately qualified adviser before making what could be one of the biggest decisions of a person’s life. Warning: Advice regarding care requires specialist qualifications and you should ensure that any adviser holds these qualifications before engaging with them. 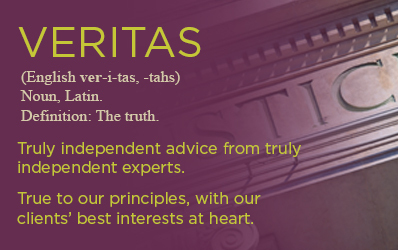 Veritas IFA Ltd hold the relevant qualifications to assist and advise you.